Alligators in Texas? Who Knew? We may not have believed it if we hadn’t seen it with our own eyes. Brazos Bend State Park in Texas has the greatest concentration of alligators in the United States outside of the Everglades. There are an estimated 300 adult alligators in the park, and we saw a total of 120 adult and child gators on our 7-mile hike along Elm and 40-Acre Lakes. Interestingly, the dogs never really noticed the alligators, even when the gators were only 10 feet away sunning themselves on a riverbank. Perhaps it’s because the alligators weren’t moving and/or because they don’t smell much. 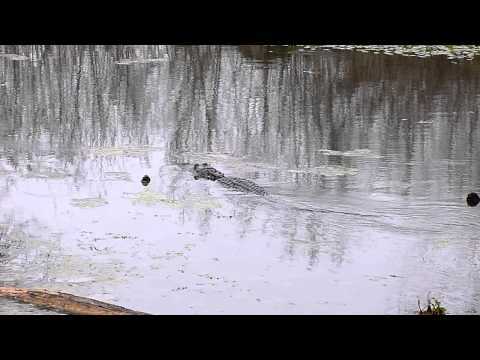 In this video, an alligator is floating away in the creek. Brazos Bend is also a haven for aquatic birds such as the American Coot. 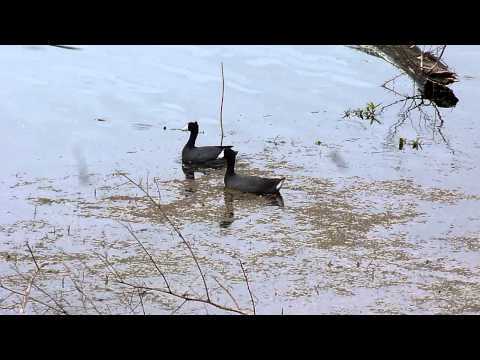 These pretty black birds have the unusual ability to run across the surface of the lake as shown in this video. The mechanical sound you hear in the video is a nearby diesel pump that was transferring water from one lake to another.